This year in April about 150,000 Dutch school children will take a traffic test called “Traffic Exam”. It is tradition Dutch school children do this test when they are in their last year of primary school. I have shown you this before in a video. But traffic experts now sound the alarm: ever more children fail the test. In 2013 6,000 children failed the test which is … a staggering 4%. So something clearly has to be done! Safe Traffic Netherlands, (Veilig Verkeer Nederland) the organisation behind the test has now developed an App, so children can learn about traffic safety in a fun way. 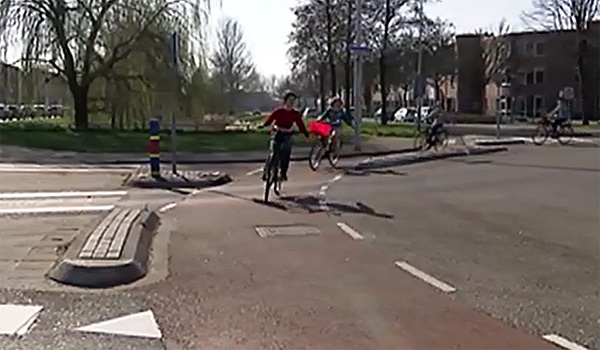 Dutch children cycling on a roundabout. “Ever more children fail the traffic test”. In this report from the news for children (Jeugdjournaal) of Monday 10th of March 2014, an expert also explains the children are not to blame, it’s their parents taking them to school in a car! According to Dutch traffic experts children have to experience traffic to learn how to behave in traffic. And they don’t experience traffic from the backseat of a car. They should cycle ahead of their parents and decide what to do, so they learn about traffic step by step. The figures about Dutch primary school children being taken to school in cars have already been explained by David Hembrow and while the Dutch think they are alarming, from an international perspective 20% to less than a third is really not so bad. Once they start secondary school 75% of Dutch school children cycle to school and only 4% is taken by car. Strangely enough the same percentage that failed the test, but that is purely coincidental of course! That an App is created to reduce a failure rate of 4% again shows how serious the Dutch take traffic eduction for (young) children. Being able to behave safely in traffic is essential in a country where everybody cycles! I cycled they test route several times with my three kids and of course they all passed the test without any problems, it’s just a matter of education by the parents. I read some time ago, that historically, the NL bike industry geared up for the rush at test time, with increased stocks of bikes for that age children. They knew from experience the tradition of buying the successfull child a new bike as their reward. As you said, taking action to reduce a 4% failure does demonstrate how seriously the gevernment take the test. The fact that some do fail, is also an indicator that it is an effective test. In England, we have school exams that have been lowered so that everyone passes, and look at the state we are in! We have a 0.2% cycling-to-school rate, and also the most unhappy kids in Europe. Co-incidence? I think not. In 1962 I also had an app but we called him Dad! It was very exciting to take the Traffic Test, het verkeersexamen, and for a week every evening my Dad and I cycled the route I would have to take on the exam day. Off course I passed and my parents were very proud of me. It is one of the dearest memories I have of my father, feeling safe in busy The Hague traffic because he was right behind me. I failed to get my learner driver permit a couple of times thanks to what I absorbed from my Dad’s driving. Q: When is it okay to break the speed limit? That is one of the most stressed things in drivers education, that you cannot ever break the limit. When I got my license, it was one of the questions. I answered correctly. It is alarming how my mother will not even let my 10 year old sister ride on her own to school, even though it is only 2.5 km away. Her problem? A busy arterial road. The drivers here will stop for you on a bicycle or if you are walking and waiting to cross, especially considering that this is only a two lane road, one in each direction with turning lanes. A slightly longer journey, about 2.7 km journey, would be to go to a signal intersection to cross that two lane road, but my mother still does not like either option. I try to convince her how safe this really is, even though it could most certainly be improved a lot and made to feel safe, especially for primary school aged children. I navigate it easily, even when I face the stop sign on my bicycle, the cars still often stop for me, even though I was prepared to wait for a gap. I am only some years older than her (sister not mother). Great post Mark. Young Dutch people seem more mature, confident and well-spoken than their counterparts in Australia. I believe this is due to the Dutch way of parenting and how society treats them. It’s not just cycling that the Netherlands is the benchmark for. 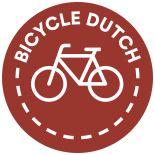 This entry was posted on 11 March 2014 by Bicycle Dutch in Original posts and tagged children, school, traffic education.